Psalm 90:12 NIV Teach us to number our days, that we may gain a heart of wisdom. I know I’ve said it before and hear others say it too. I can’t believe that it’s already 2013. If this year is like last, it will fly by. If you’re like me, you’ll probably be busy the entire time. The problem with being busy is that it doesn’t necessarily translate into being productive. I’m sure I’m not alone in having days where I’ve been busy from beginning to end but really didn’t accomplish anything significant. If I consider my goals, this busyness can be a distraction from meeting them. As I count my days this year, I will be paying closer attention to what I’m actually accomplishing. Of course, I’m not going to do my work alone. I will be resting on the Lord as I build an even greater relationship with God in all things. Good health and fitness will help me to better live the purpose God has for me. I will also be seeking the favor of the Lord and reminding myself of God’s promises. Plans are being made and days are being counted. 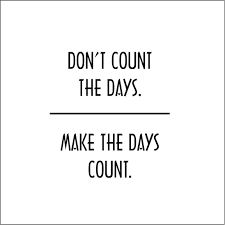 This is not simply for the exercise of counting, rather it is to make every day count.